Kathy is a gifted comedian, award-winning actress, accomplished author, and renowned inspirational speaker. 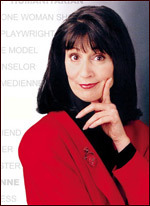 Billed as ” America’s First Hearing Impaired Comedienne”, Kathy is also a five-time American Comedy Award Nominee as Best Stand-Up Female Comedienne. As an actress, she is known for her guest starring roles on shows such as Touched by an Angel and for her critically acclaimed one woman Off-Broadway show, Don’t Buck with Me/Now Hear This! As a motivational speaker, she inspires hundreds of thousands of people around the world, sharing her story of overcoming some of the most difficult obstacles one can imagine in life, and how she met those challenges with dignity, courage, and laughter. Kathy’s book, If You Could Hear What I See, will have you laughing and crying as you experience the amazing story of her life. She has received thousands of letters and emails of thanks and praise, regarding both her book and her original PBS special, No Labels, No Limits!. She was awarded the “CINE Golden Eagle Award” as the writer and executive producer of the special, and the “Media Access Award for Outstanding Television Special”. Success, however, in the theater or any other medium, was far from her mind the first time Kathy stood the world of comedy on its ear. On a dare from a friend, she entered a comedy contest called, “Stand-up Comic Take a Stand”, in 1988. She was nervous. Not because it was her first time performing comedy on a stage, or even the fact that she couldn’t hear the audience response except by vibration from the stage floor. What made her nervous was discovering that she was competing against comedians who had been in the business for years. During her late teens, Kathy’s life was interrupted when she was run over by a jeep while sunbathing on a beach. As a result, she experienced intermitted paralysis in her legs. Her recovery took almost five years. Then, just six years later, she was diagnosed with cervical cancer. Undaunted, she has turned roadblocks into springboards, using her personal experience as launching pads for humor and the education of others. Kathy has appeared on such programs as The Tonight Show, The Today Show, Good Morning America, CBS This Morning, Entertainment Tonight, Extra, Inside Edition, Turner Entertainment Report, CNN’S Show Biz Today, Real Life, and Geraldo. She has been featured in several national magazines, including People as one of their most touching stories and has performed on shows such as Stand-Up Spotlight (VH-1), Comic Strip Live (FOX), Evening at the Improv (A&E), and Caroline’s Comedy Hour (A&E). Among her many honors, Kathy has received the “Woman of The Year Award” from the Oralingua School, “American Hero Award” from the City of Hope as their role model of the year, the Toastmasters “International Communication and Leadership Award”, the Dole Foundation “Media Awareness Award” for her dedication to all people with disabilities, the National Council on Communicative Disorders “Individual Achievement Award”, and the “Hear Now Help America Hear Award” for her commitment to children. She is a key motivational speaker for Anthony Robbins’ “Life Mastery Classes” and works to entertain and enlighten people of all ages, but her heart belongs to children. “Every child deserves to have a real childhood,” Kathy asserts. “And they should have healthy role models to show them that people do care about them deeply.” Kathy speaks to the child in all of us. Whether performing in a comedy club, appearing on television, speaking publicly, teaching at camps for children and teens, or appearing in any number of other settings, Kathy Buckley brings her message that anything can be achieved when the heart and the mind work together.